Kollu or horsegram dal/kulith is well known for its health benefits, particularly amongst people wanting to lose weight and stay healthy. According to WIKI , scientists from the Indian Institute of Chemical Technology have found that unprocessed raw horse gram seeds not only possess anti-hyperglycemic properties but also have qualities which reduce insulin resistance. The scientists made a comparative analysis between horse gram seeds and their sprouts and found that the seeds would have greater beneficial effects on the health of hyperglycemic individuals. The majority of anti-oxidant properties are confined to the seed coat and its removal would not do any good. Raw horse gram seed is rich in polyphenols, flavonoids and proteins, major anti-oxidants present in fruits and other food materials. The seed has the ability to reduce post-prandial hyperglycemia by slowing down carbohydrate digestion and reduce insulin resistance. 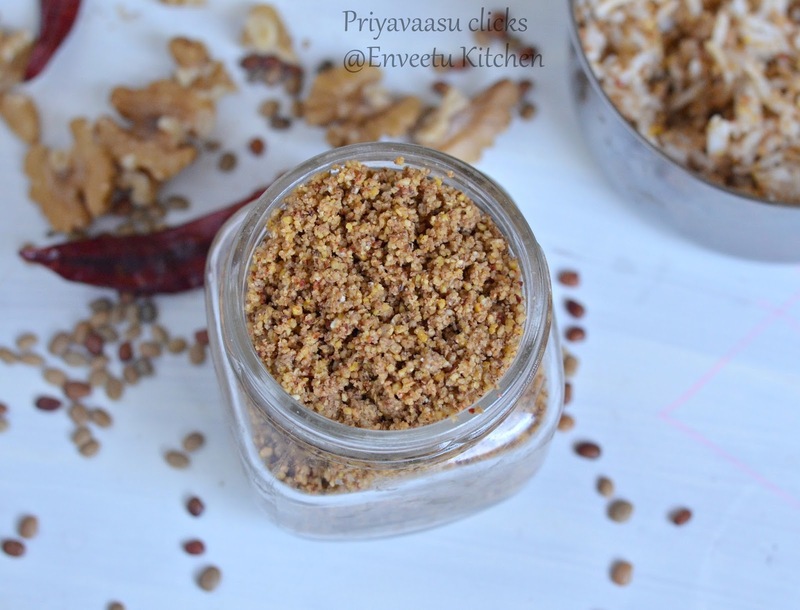 This Kollu rice mix powder is something i tasted at my sister-in-law's place. I couldn't exactly remember the reciep, so i tried to mix and match the ingredients to my taste and got this powder. 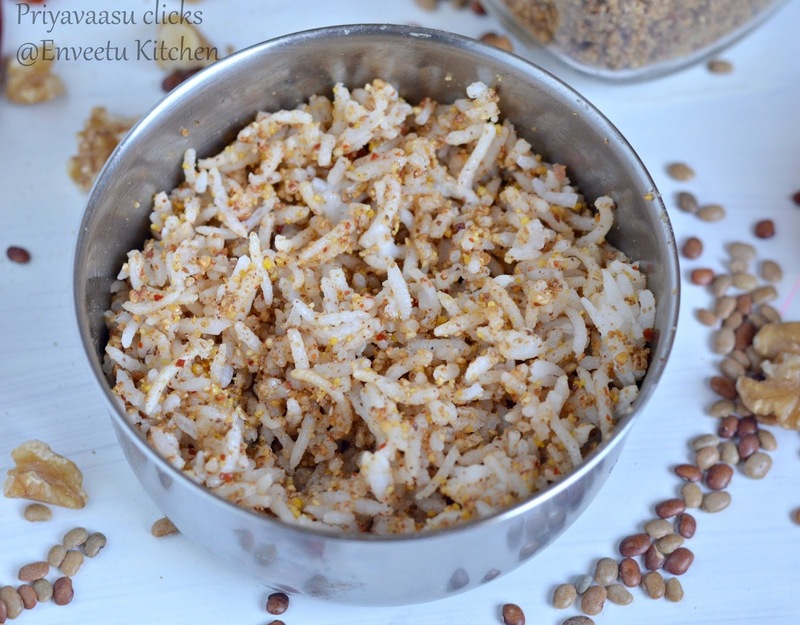 This tastes awesome with rice and Gingely oil and makes a good Mixed Rice for lunch box. Dry roast each ingredient separately until golden brown. While roasting sesame and walnuts, switch off the flame and roast them in the residual heat. Let the ingredients cool completely. Take them together in a small mixer and grind them to a powder. Do not run the mixer continously, since walnut and sesame would release oil and will become butter. So pulse the mixture, to get a almost fine powder. The powder might look all clumpy, spread it on a plate and let it rest for a while, it will separate. Store the powder in an air-tight bottle. To Mix it with rice, for 2 fistfuls of cooked rice, just add a tsp of this spice mix with a tsp of gingely oil and adjust salt and mix well. Enjoy with any crisp of dry curry on the side. Healthy podi and that bowl of rice is tempting. 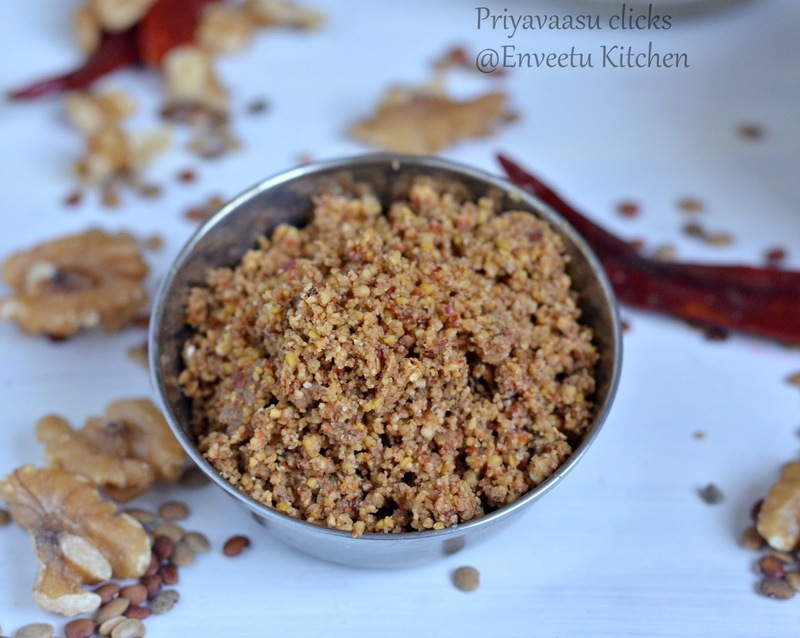 Would surely want to try this Priya..great one..I love such podis and kollu is already my favorite!